Create strategy maps with 4 perspectives, cause-and-effect connections, and strategic themes. 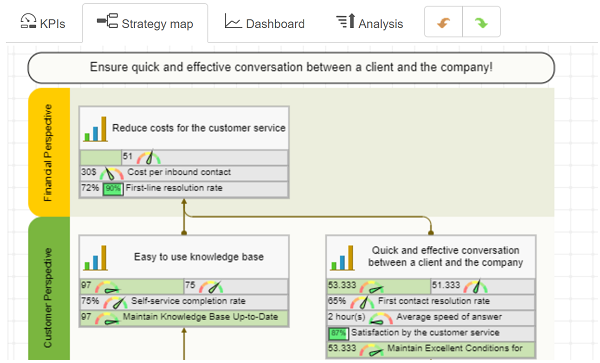 Align KPIs and action plans with business goals on strategy map. Setup Key Performance Indicators (KPIs) with weight, measure units, and performance formulas. Access external data bases with SQL queries, import from Excel, or simply enter data manually. 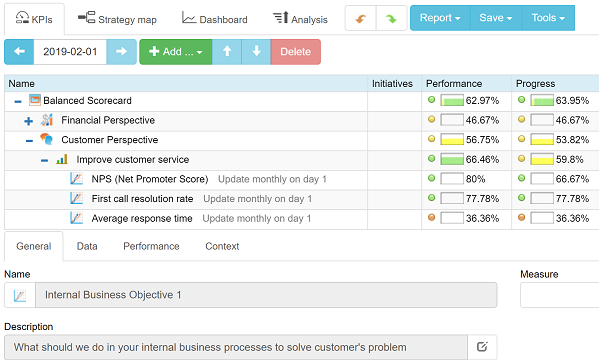 Analyze data in your business scorecard, find indicators that need your attention, and generate performance reports. Building a scorecard for a large company with multiple locations and departments? Present the organizational structure, cascade scorecards, and define access rights for the key members. 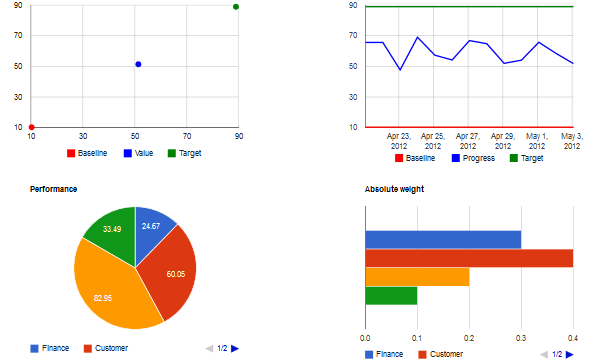 Create a detailed BI dashboard(s) with the charts for the most important KPIs. Help your team to be focused on the key aspects of the organization's performance. Try all of the features of BSC Designer® Online for free. Start your 30-day trial account today and learn how BSC Designer® Online can improve the strategy execution process at your organization. Easy sign up: no credit card required! Create professional strategy maps. Add important business goals, specify cause-and-effect connections between them. Use strategic themes. Try Strategy Map Wizard. Create KPIs, specify their weight, measure units, and performance formula. Access external data sources with SQL queries, import your data from Excel, or enter it manually. Grant access for members of your team to specific indicators only, or share your scorecard with all of the persons involved. Import data from Excel, get connected to SQL databases, or build a cascade of indicators by linking to other scorecards of BSC Designer. Forecast the value of KPI, find indicators that were not updated on time, and indicators that are not performing well and need your attention. Prepare for the company's performance presentation! 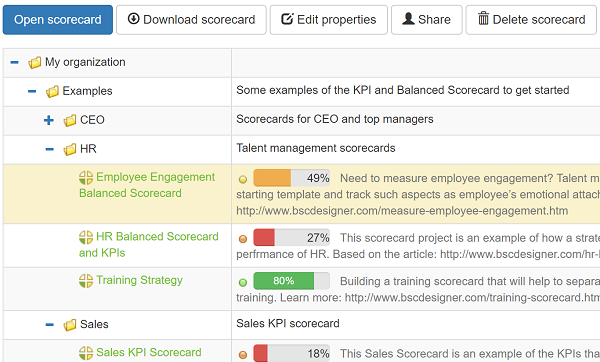 Generate professional performance reports for specific KPIs and for the whole scorecard. BSC Designer® Online is a user-friendly tool that helps you to build your own business scorecard with strategy maps and KPIs in just few minutes. The prices below are for 1 power user. The final price per power user depends on the preferred billing cycle. Power user can add additional view only users for free. 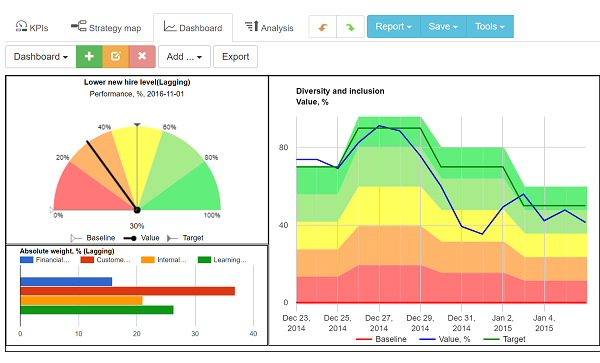 View only users can access KPIs and strategy maps. BSC Designer® Online can be seamlessly integrated with BSC Designer PRO desktop version for Windows. Basic customer support is included with each account. Feel free to send us a message via a contact form. Perfect for those who want to start using BSC Designer® Online right now. No long-term compromise. Ready for a long-term compromise? Choose annual billing plan and save $120 per user per year. We used BSC Designer to build an overall index... I was trying to prepare something similar in MS Excel, however it was too complicated to update with new data. Very easy to use and it provided me with a powerful functionality. BSC Designer helps with the implementing of company's strategy. 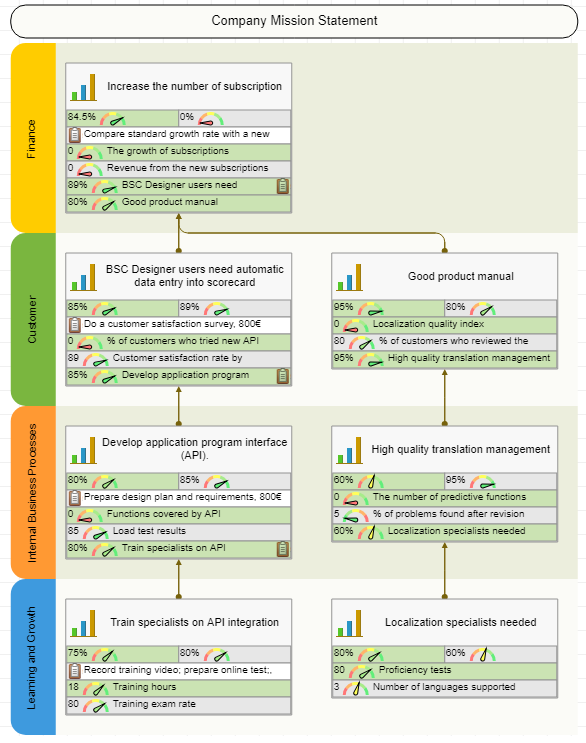 BSC Designer provides a visual method for viewing all of the key elements of BSC. The interface looks rather intuitive and helps the user to know his/her way around easily.